Do you like to eat healthy? Do you want to control what you eat? Do you want to eat more fruits and vegetables but do not have time to prepare and cook them? Then you need to include an indian mixer grinder to your cooking repertory. The Butterfly Desire is available for 1/3 the price of the popular Blendtec and Vitamix grinders. 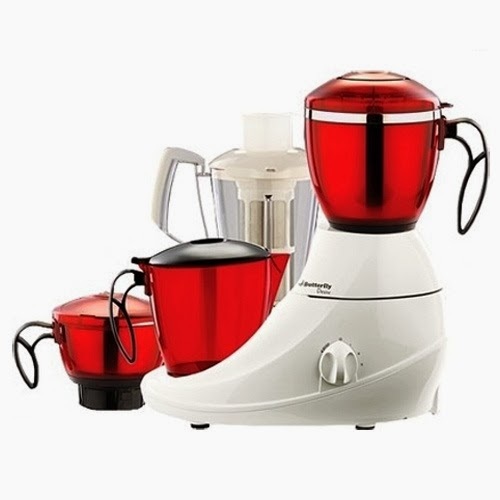 It can also be used for juicing, blending and grinding similar food products. Why pay three times more for a juicer/grinder when you can buy a Butterfly Desire for less and get 4 Polycarbonate jars for easy storage of what you have made. With your new Butterfly Desire indian mixer grinder you can start the new year with controlling what is in your food. Juicing seasonal fruits and vegetables is a good way to get more of them in your diet. This indian mixer grinder can process fruits and vegetables to release its nutritional benefits and blend it. You can also save prep and clean up time. You can also store what you make in the easy-to-store container jars that come with the Butterly Desire indian mixer grinder. You no longer have to buy juices, gravies, chutneys, batters etc from the store where they are made with preservatives to have a long shelf-life. You can control what you eat. Make your own fresh juices, batters and chutneys, pave the way for healthy eating, buy your Butterfly Desire with Bombay Electronics today. Whats more, if you do not like the indian mixer grinder for any reason, you can always return it. Not only that when you buy with Bombay Electronics you get free shipping and tech support for any questions you have with regard to using it. Take control of what you eat, incorporate more fruits and vegetables into your diet the easy way, buy your Butterfly Desire indian mixer grinder with Bombay Electronics today.